The woman was a victim of domestic violence, authorities say. The woman from the video was subjected to domestic violence but is now safe, police said, five days after she was caught on the surveillance camera ringing the doorbell of a house. From the day the video went viral, concerned people the world over were hooked to the hunt for the woman's identity and for clues to her story. Police said they arrived at a house on Wednesday in response to a call about a man threatening to kill himself, and found the woman’s 49-year-old boyfriend lying dead of a gunshot wound. The death is believed to be suicide, police said. The 32-year-old woman was mentioned in his suicide note but was not on the scene, officials stated. (Montgomery County Sheriff) Police say the mystery woman seen on video has been located. Authorities were still in the dark about what may have been the most disturbing part of the video — something that appeared to be broken restraints on both her wrists. 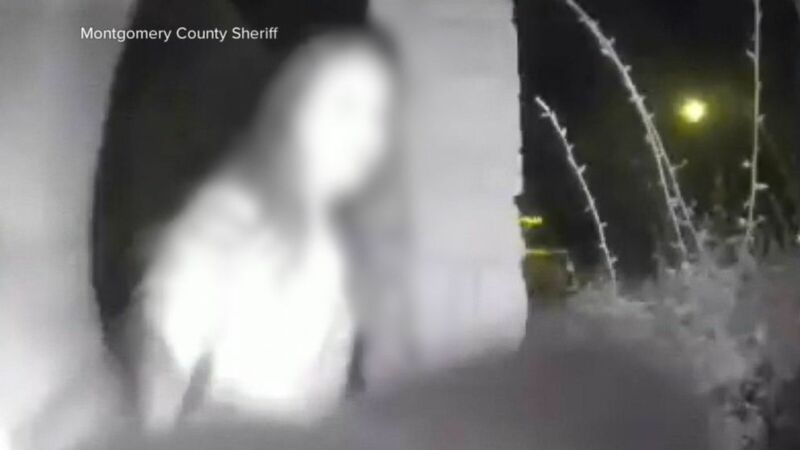 "There are some issues obviously with the video surveillance and why she was wearing those restraints and the circumstances surrounding it," Lieutenant Scott Spencer of the Montgomery County Sheriff's Office said. "She is currently outside Montgomery County and our investigators will be meeting with her to continue the investigation." The house was in Sunrise Ranch, the same neighborhood as the one whose doorbell the woman had tried to ring. A resident who lives in the area, but does not wish to be identified, told ABC News that the woman had rung the doorbell of several different neighbors, but by the time they answered their doors, she had disappeared. In the 7-second video that was shared over 32,000 times and received more than 8,600 comments as of Wednesday night from people from as far as the United Kingdom, the woman can be seen emerging from behind a bush next to the house, barefoot and wearing only a T-shirt, with unknown items dangling from both of her wrists.